Owensboro's FREE Guide to Raising a Family! When our children are involved in sports at a young age, we want to be involved parents and encourage them to have fun and be part of a team. As they grow, our role as a supportive sports parent tends to change. We have all seen that parent at the ballgame. There may have even been a rare moment when we were that parent. You know, the one that everyone can’t help but notice because they are yelling at an octave that no one can ignore. Their passion for supporting their child and winning the game far surpasses anything else that is happening at the moment. So what do we do when our desire to push our children to be successful overwhelms our sense of good sportsmanship? What if we stepped back and re-evaluated the options of responding versus reacting? Listed below are some common unbecoming behaviors that parents can sometimes display at sporting events, and some positive suggestions by local coaches on how parents can be better sports themselves. Try: Staying positive. Be present at games and offer words of encouragement, rather than criticism. Apollo Baseball Coach, Bob Mantooth, suggests that parents, “refrain from giving instructional criticism during the game…It can be difficult for kids when their parent’s voice is singled out. It can be distracting. All of us want what we think is best for our kids, and we want success for our children, but nothing good can come from being critical.” Instead, reassure your child after the game, and trust that they are aware of any mistakes they made and that the coach will work with them on how to improve. Try: Supporting the coach and consulting with them as to what suggestions they may have for improvement in fundamental skills instruction. By showing that you are working with the coach, your child will have more confidence knowing that you are both investing your time for a common goal. KFL President and DCMS Football Coach Todd Humphreys says, “I know it can be hard sometimes, but parents should always support the coach. That doesn’t mean they have to agree…but give the benefit of the doubt that (the coach) does have the best intentions for your child in mind.” Any questions or concerns you have about your child or the coach’s approach should be brought to the coach privately and not voiced in front of your child. Try: Remembering that the umpires and referees are the authorities on the field, and they should be respected as such. Try: Placing yourself in the shoes of that player’s parent. The most important thing to remember is that the child in question is someone else’s child. Even if the child’s athletic ability or attitude come into question, they are still a child playing a game. They have coaches and grown-ups in their lives that can deal with situations when they arise. In order to foster a more positive atmosphere, Coach Mantooth suggests that a parent not only support their child and their team, but “be supportive of both teams.” Imagine the character lessons your child will absorb if he/she consistently witnesses you appreciating the efforts of both teams in play. Try: Cheering for your child, the team, and your child as part of the team. Be a team supporter, and your child’s biggest fan, regardless of their ability, or what the scoreboard says. This does not mean to give your child the impression that they are superior or better than their abilities, it simply means that you recognize the effort they (and the team) have put into practice and play. Coach Mantooth says to “put emphasis on the kind of teammate they are. It doesn’t necessarily take athleticism to be a good teammate.” Teach them to hold their head high when they lose, and be a humble and gracious winner who respectfully shakes hands at the end. Lovingly remind them that everyone makes mistakes, and that there is always room for improvement. Teach them to respect others, have respect for themselves, and to respect the sport. Melody Ann Wallace is a sixth grade language arts teacher at Daviess County Middle School that has been writing since she was old enough to hold a crayon, and is currently working on her first novel. Owensboro Parent is a FREE magazine because of the support of organizations & businesses in our community. 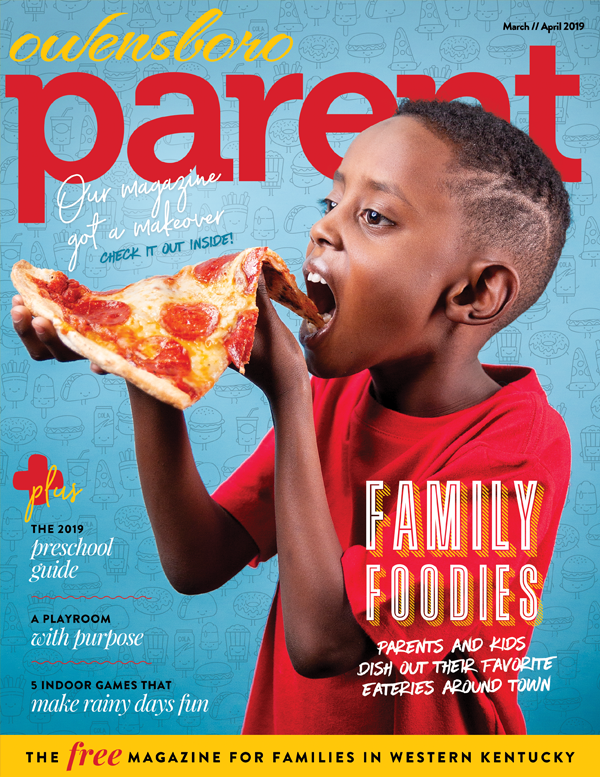 The magazine is distributed in Owensboro to many professional offices, child care centers, and businesses who advertise with Owensboro Parent. Covering local events, regional attractions, health-related articles, education articles, local businesses, entertainment reviews and travel information, Owensboro Parent strives to be an essential companion for parents. Sign up to receive email updates weekly and to hear what's going on with us!